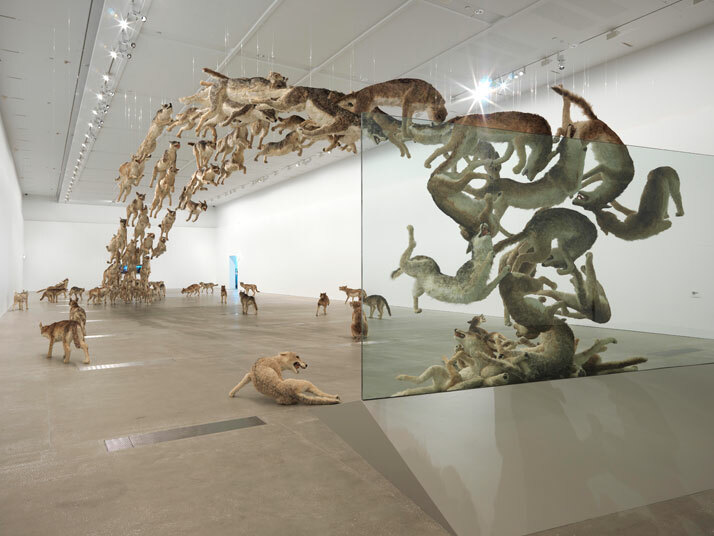 The first Australian solo exhibition of celebrated Chinese artist and curator Cai Guo-Qiang (known for his gunpowder paintings, firework events and surreal animal sculptures) is now on display at Queensland Art Gallery | Gallery of Modern Art (QAGOMA) in Brisbane, Australia. 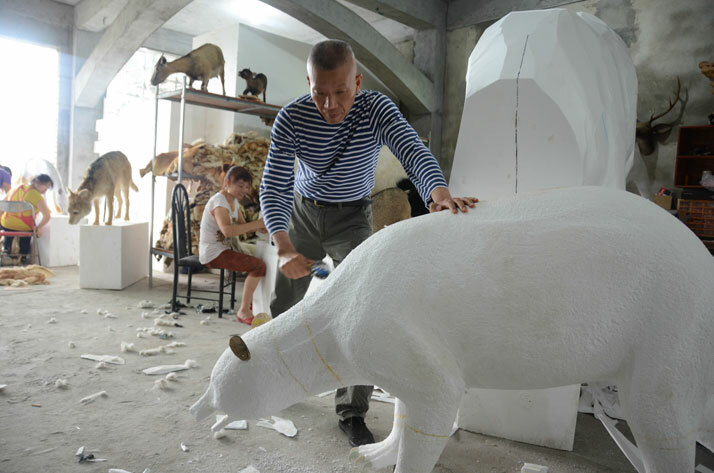 The exhibition, titled Falling Back to Earth, is based on the idea of ‘‘going home,’’ in other words, returning to the harmonious relationship between man and nature and includes packs of life-size animal sculptures, a pond filled with 170 tonnes of water and a real eucalyptus tree hanging indoors. Photo by Cai Canhuang, courtesy Cai Studio. The exhibition boasts two new commissions created especially for this event. 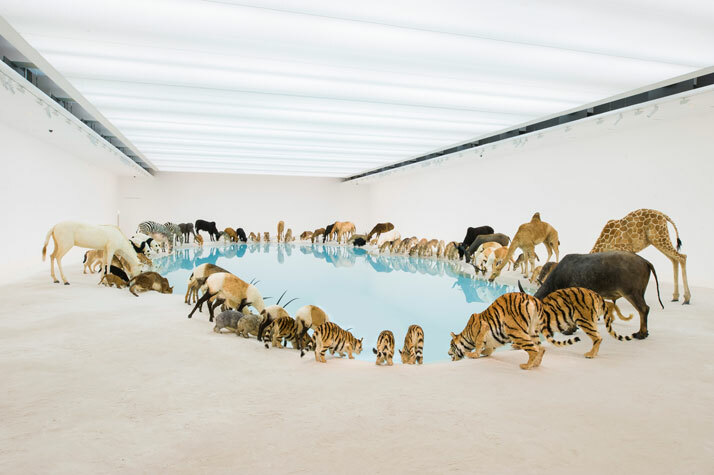 For the first one, ‘‘Heritage’’ (2013), 1100 square meters of exhibition space have been transformed into an indoor pond lined with white sand, around which 99 replicas of animals are set drinking water peacefully. 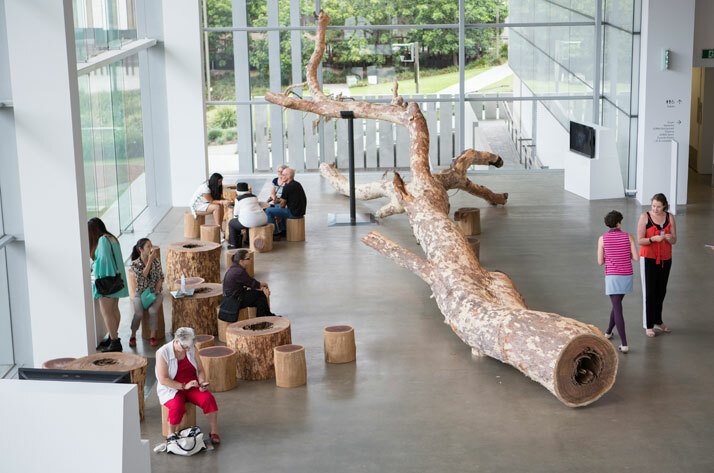 The second one, ‘‘Eucalyptus’’ (2013), sees a real eucalyptus tree occupying GOMA’s central gallery, with seating available for visitors to observe and meditate. According to the exhibition’s curator Russell Storer, the new commissions drew on the striking beauty of Queensland’s landscapes and the exquisite imagery in historical Chinese painting and poetry, to express concerns regarding the ecological and social issues of our time. 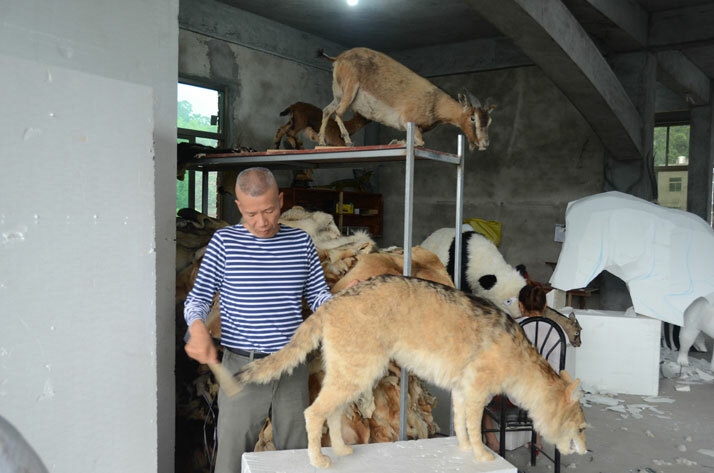 In addition to the new commissions, the exhibition includes the notorious ‘‘Head On’’ installation from 2006 (where a pack of 99 wolves run into a glass wall), a Tea Pavilion (where people can sample tea from Guo-Qiang’s hometown and watch a documentary about the making of the exhibition) and an interactive installation for children. 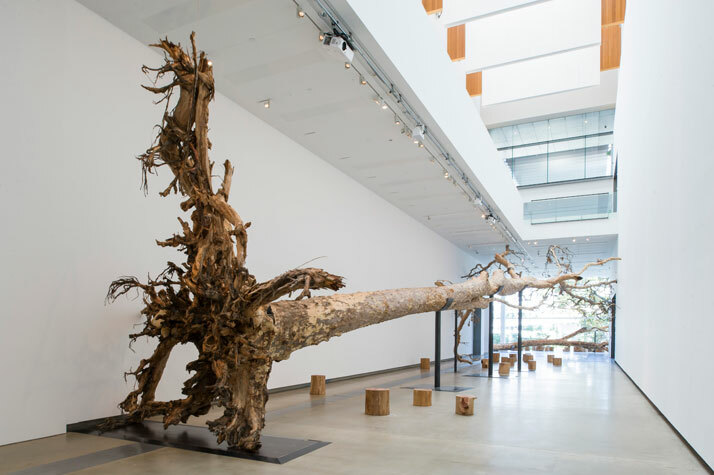 Alongside the main exhibition, a detailed chronology of Guo-Qiang’s work, including early works, ephemera, photographs and artefacts selected by the artist from his private collection and the QAGOMA Research Library, will be presented in the GOMA Foyer. A publication (including photographs of the new installations and essays by leading curators and critics) is expected to be released in January 2014. 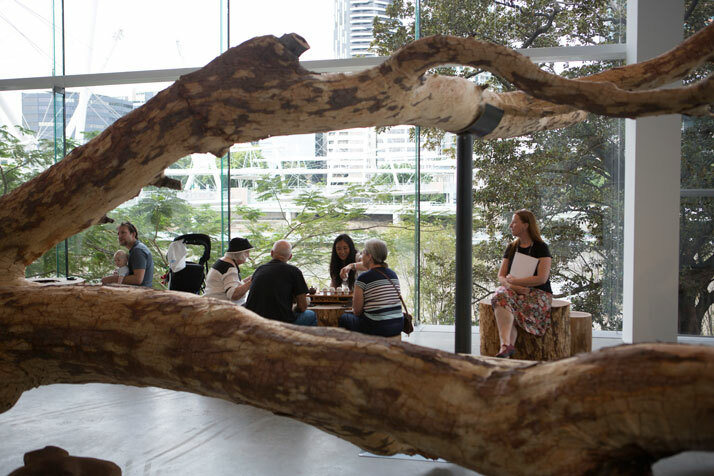 Falling Back to Earth will be on show exclusively at the Gallery of Modern Art, Brisbane, Australia (GOMA) from 23 November 2013 to 11 May 2014. 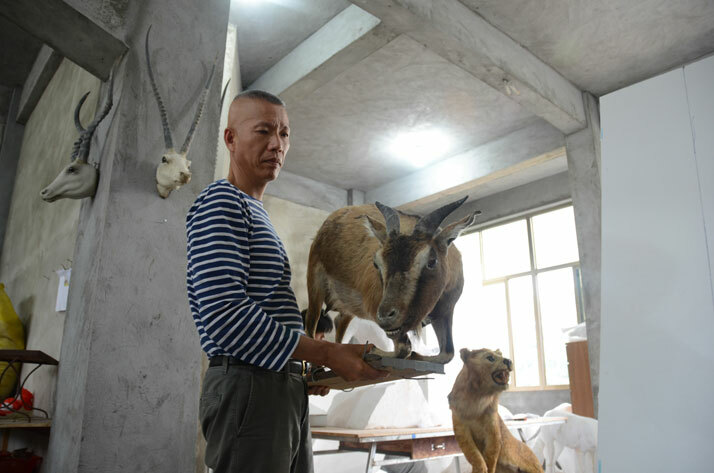 Photo by Yuyu Chen, courtesy Cai Studio. 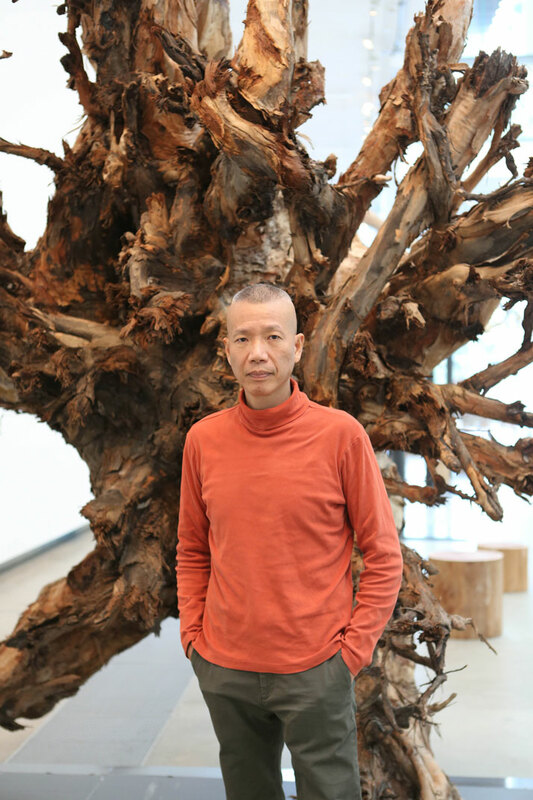 Cai Guo-Qiang in front of installation Eucalyptus at the Gallery of Modern Art, Brisbane, Australia, 2013.